On the cover: “Snow White” by Jung Von Matt for Ed. Wüsthof Dreizackwerk KG. New apple cultivars are being developed at WSU, but many older varieties are also making a comeback in local markets. 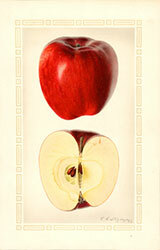 Browse some of the heirloom apples below, selected by editor Tim Steury. While some of these varieties might not appear on the standard supermarket shelves, one can find some of them in farmers markets and specialty food stores. WSU’s Tukey Orchard has a number of them in its variety block. Jack Feil at East Wenatchee’s Feil Pioneer Orchards (established in 1908) probably has all of them. 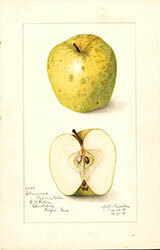 Descriptions are from The apples of New York (Spencer Ambrose Beach, 1905) and images are courtesy the U.S. Department of Agriculture Pomological Watercolor Collection. 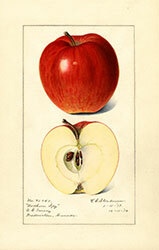 Baldwin :: The Baldwin is a bright red winter apple, above medium in size or large, and very good in quality when grown under favorable conditions. It stands handling well because of its firm texture and thick skin. Flesh: yellowish, firm, moderately coarse, crisp, rather tender, juicy to very juicy, agreeably subacid, sprightly, somewhat aromatic, good to very good. Season: November to March or April in common storage; to May or later in cold storage. Uses: Well adapted for general market, dessert and culinary uses. Grimes Golden :: A synonym for Grimes. Fruit beautiful rich golden-yellow, attractive in form and excellent either for dessert or culinary use. Skin: tough, somewhat rough, clear deep yellow with scattering pale yellow or russet dots. Flesh: yellow, very firm, tender, crisp, moderately coarse, moderately juicy, subacid, rich, aromatic, sprightly, very good to best. Season: November to January or February. Commercial limit, December or January. 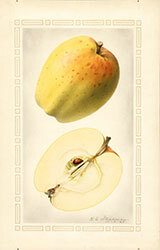 Fameuse (Snow apple) :: Fameuse is one of the most desirable dessert apples of its season. It is very beautiful in appearance and the flesh is white, tender and excellent in flavor and quality for dessert. It is decidedly inferior to other varieties of its season for culinary purposes. 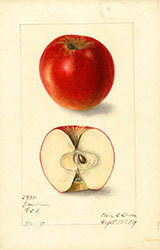 Skin: thin, tender, smooth, light bright red deepening to almost purplish black. Flesh: white, sometimes streaked or stained with red, very tender, juicy, subacid becoming very mild subacid or sweetish, aromatic. Season: October to midwinter. 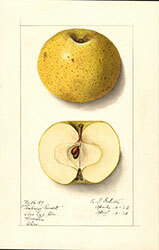 Golden Russet :: Golden Russet fruit is particularly desirable for use during the spring months before small fruits ripen, being then excellent for dessert and culinary uses. It makes good evaporated stock and is excellent for cider and stock food. Skin: thick, moderately tender, sometimes only partly covered with patches and flecks of russet but more often almost entirely covered with green or yellowish russet. Flesh: yellowish, rather fine-grained, moderately crisp, tender, juicy, rich, agreeably subacid, aromatic, very good. Season: December to April or later. 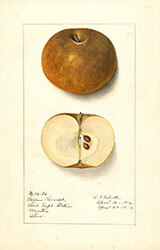 Roxbury Russet :: When well grown, the Roxbury is of good size, and rather attractive for a russet, but it varies greatly in size and appearance in different localities. Skin: tough or moderately tender, sometimes almost smooth, but usually largely covered with greenish to yellowish-brown russet. Highly colored specimens develop a bronze blush which rarely deepens to red. Flesh: tinged with yellow or greenish, firm, somewhat coarse, moderately tender, breaking, juicy, sprightly subacid, good to very good. Season: December to May or in cold storage to July. Winter Banana :: Winter Banana fruit is large, clear pale yellow with beautiful contrasting pinkish-red blush, attractive in appearance, characteristically aromatic, of good dessert quality, but too mild in flavor to excel for culinary uses. Skin: smooth, moderately thick, tough, waxy, bright pale yellow, often with a blush which in well-colored specimens deepens to dark pinkish-red. Flesh: whitish tinged with pale yellow, moderately firm, a little coarse, somewhat crisp, tender, juicy, mild subacid, distinctly aromatic, good to very good. Season: from mid-November to the first of April, but its safe commercial limit in New York’s climate probably would not extend much beyond December. Palouse :: Palouse is a variety which originated in Washington. It is classed as a late fall variety, being in season from October to early winter. The original tree was located five miles east of Colfax, and was introduced about 1892 by George Ruedy of Colfax. Skin: bright yellow, blushed and more than half covered with crimson, splashed, blotched and dotted with darker red. Flesh: yellowish, crisp, firm, tender, juicy, very aromatic, subacid, very good. Season: October and early winter. Esopus Spitzenberg :: The Esopus Spitsenburg, commonly known as the Spitzenburg, when well grown is handsomely colored and unexcelled in flavor and quality. 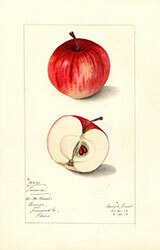 It is a choice dessert fruit and also one of the best apples known either for canning or for general culinary uses. It is well adapted for handling in cold storage and ships well. Skin: tough, sometimes waxy, slightly roughened by the russet dots, deep rich yellow often almost completely covered with bright red inconspicuously striped with darker red, in the sun deepening to a very dark, almost purplish blush, marked with pale yellow and russet dots. Flesh: tinged with yellow, firm, moderately fine, crisp, rather tender, juicy, aromatic, sprightly subacid, very good to best. Season: November to February or later. In cold storage may be held till June. Smokehouse :: Smokehouse fruit is uniform in size, symmetrical and attractive in appearance when well colored; but too often its color lacks character, being neither distinctly yellow nor distinctly red. It is a very pleasant flavored dessert apple but hardly acid enough for most culinary uses. Skin: thin, tough, smooth or slightly toughened with capillary russet lines and russet dots; color yellow or greenish mottled with rather dull red, sometimes deepening to a solid bright red, indistinctly mottled, striped and splashed with carmine. Flesh: slightly tinged with yellow, rather firm, moderately fine, crisp, moderately tender, juicy, mild subacid, delicately aromatic, with an agreeable but not high flavor, good. Season: October to February or March. 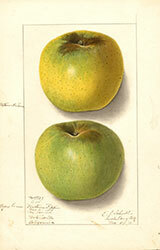 Newtown Pippin :: The name Newtown Pippin refers to both the Green Newtown and the Yellow Newtown. 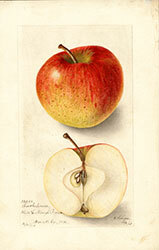 The “Newtown Pippin” was the first American apple which attracted attention in Europe, introduced there in 1759. Skin: Green Newtown rather tough, smooth or slightly roughened with brownish-russet dots, grass-green at fruit harvest but sometimes pretty yellow later, and often showing some brownish or brownish-pink color, especially near the base. 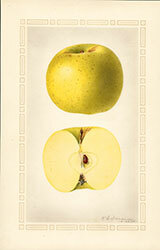 Yellow Newtown are bright yellow often with distinct pinkish blush. Flesh: yellowish or tinged with green according to the color of the fruit, firm, crisp, tender, moderately fine-grained, juicy, sprightly, with a fine aromatic subacid flavor, best. Season: February to May. Jonathan :: Jonathans are very beautiful, of a brilliant red color, highly flavored and of excellent quality for either dessert or culinary use. It excels in hardiness, productiveness, health and vigor and is adapted to a wide range of territory. Skin: thin, tough, smooth, pale bright yellow overlaid with lively red, striped with carmine. Flesh: whitish or somewhat yellow, sometimes with tinge of red, firm, moderately fine, crisp, tender, juicy, very aromatic, sprightly subacid, very good to best. Season: November to January or later. 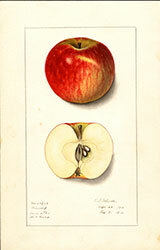 Winesap :: Winesap is one of the oldest apples in America, and one of the most popular in the past. It tends to be smaller than average and uniform in size. Skin: medium in thickness, tough, smooth, glossy, bright deep red indistinctly striped and blotched with very dark purplish-red over a distinctly yellow ground color or green if not fully mature, overspread with faint bloom. Flesh: tinged with yellow, veins sometimes red, very firm, rather coarse, moderately crisp, very juicy, sprightly subacid, good to very good. Season: from January to June. 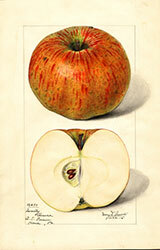 Gravenstein :: Gravenstein is an apple of good size, attractive appearance and excellent quality. For culinary purposes it is perhaps unexcelled by any variety of its season. 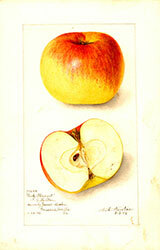 Skin: thin, tender, slightly rough, greenish-yellow to orange-yellow overlaid with broken stripes of light and dark red. Flesh: yellowish, firm, moderately fine, crisp, moderately tender, juicy, sprightly subacid, aromatic, very good to best. Season: late September till early November. Twenty Ounce :: Twenty Ounce is highly esteemed for home use. 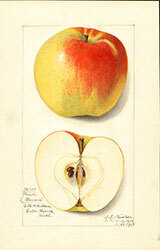 The fruit is large, attractive, green becoming yellowish with broad stripes and splashes of red. It is in season from September to early winter. It keeps well for a fall variety and stands shipping well. Skin: thick, tough, greenish becoming rather yellow, washed, mottled and splashed with bright red or deepening to dark or purplish-red with carmine stripes. Flesh: whitish somewhat tinged with yellow, coarse, moderately tender, juicy, subacid, good for culinary use, second rate for dessert. Season: late September to early winter. 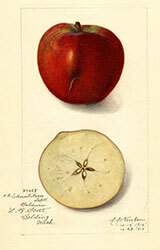 Northern Spy :: Northern Spy fruit is large and attractive, being of a bright red color, overspread with a delicate bloom. The flesh is very juicy, crisp, tender and most excellent for either dessert or culinary uses. It is not a good variety for evaporating because it is too juicy and tender. Skin: thin, tender and smooth. In highly colored specimens it is glossy and the clear pale yellow ground color is nearly concealed with bright pinkish-red mottled and splashed with carmine and overspread with a thin delicate bloom. Flesh: yellowish, rather firm, moderately fine-grained, very tender, crisp, very juicy, sprightly, aromatic, subacid, very good to best. Season: ready for use in November and December, and retains its crispness and high flavor remarkably well. Rhode Island Greening :: Rhode Island Greening is generally regarded as one of the very best cooking apples grown being almost the peer of Esopus Spitsenburg and decidedly superior to Baldwin for all culinary purposes. It is also very good in quality for dessert use. The fruit is medium to large and very large. Skin: moderately thick, tough, smooth, waxy, grass-green varying to rather yellow, sometimes with brownish-red blush which rarely deepens to a distinct bright red. Flesh: yellowish, firm, moderately fine-grained, crisp, tender, juicy, rich, sprightly subacid, peculiarly flavored, very good in quality. Season: October to March or April in common storage. It ripens rapidly during periods of warm weather in autumn and does not stand heat well before going into storage. Peck Pleasant :: This variety is more highly esteemed for dessert than for culinary uses. The flesh is tender, pleasantly flavored and ranks very good to best in quality. 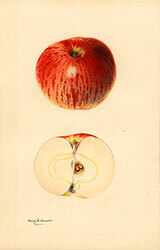 Skin: moderately thick, tough, smooth, green becoming bright waxen yellow with orange-red blush, sometimes partly deepening to pink. Flesh: yellowish, firm, tender, crisp, fine-grained, juicy, pleasant subacid, aromatic, very good to best. Toward the close of the season it becomes inferior in quality although it may appear to be still in good condition. Season: October to March. Yellow Bellflower :: Yellow Bellflower grows large or even very large, but usually it is variable in size. It is generally highly esteemed for culinary uses and also for its excellent dessert qualities, although it is rather too briskly subacid to suit the tastes of some, particularly during the early part of its season. It does not reach its best condition for dessert use till January or later, when its acidity becomes somewhat subdued. Skin: smooth, bright, pale lemon-yellow varying to whitish in the shade and often with a shade of brownish-red in the sun which in highly colored specimens deepens to a pinkish-red blush. Flesh: whitish tinged with pale yellow, firm, crisp, moderately fine-grained, rather tender, juicy, aromatic. Season: December to April. The apples of New York :: by Spencer Ambrose Beach, 1905. Both volume one and volume two are available on the Internet Archive as PDF, ePub, Kindle, online, and other formats. 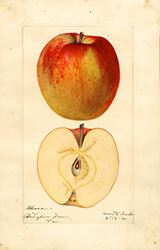 Heirloom Apples :: An article by Karen Palmer, from Clark County Extension, on heirloom apples, including good varieties to grow in Western Washington and reading lists.